TORONTO — ValueAct’s Jeffrey Ubben disclosed a new position in utility Hawaiian Electric at the Capitalize for Kids investors conference in Toronto. In a presentation on Thursday, Ubben said ValueAct’s new VAC Spring fund’s newest and largest position is in Hawaiian Electric, a utility company based in Honolulu. The VAC Spring fund, launched in 2018, focuses on promoting environmental and social goals for the companies it invests in. 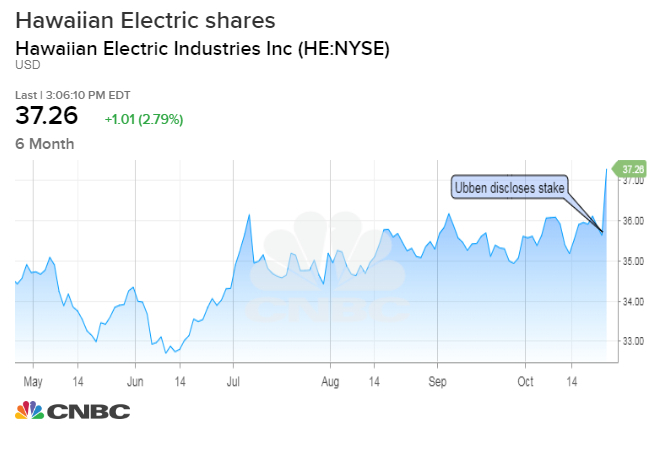 Shares of Hawaiian Electric spiked higher following Ubben’s presentation and were up more than 3 percent about an hour before the closing bell. Ubben’s fund manages $15 billion. The fund manager cited an independent study during his presentation that found that if current technology was fully deployed on Hawaii, the state could run on more than 80 percent renewable energy and rake in $6.5 billion in savings. In 2017, half of all petroleum burned for electricity in the United States was burned in Hawaii, according to his presentation. He also said that the company also operates a banking division, which could be leveraged to help fund rooftop solar infrastructure. The bank enjoys one of the lowest cost-of-deposit of any bank in the country, Ubben said.